The Vernier Colorimeter is used to determine the concentration of a solution by analyzing its color intensity. The cuvette slot is designed to accommodate most cuvettes with a 10 millimeter path length. The Colorimeter measures the amount of light transmitted through a sample at a user-selectable wavelength. You may choose from four wavelengths: 430 nm, 470 nm, 565 nm, and 635 nm. Features such as automatic sensor identification and one-step calibration make this sensor easy to use. The Colorimeter may require a compatible interface and software. Choose a platform below to see compatible interface and software options. The Colorimeter is fully supported with LabQuest 2 (version 2.8.5), a standalone data logger with built-in graphing and analysis software. This sensor and interface combination can be problematic when measuring at 565 nm. The software will identify the sensor and load a default data-collection setup. Connect the sensor following the steps in the Getting Started section of this user manual. After connecting the sensor, the following steps must be completed prior to starting data collection. Press the < or > button on the Colorimeter to select the correct wavelength for your experiment (430 nm, 470 nm, 565 nm, or 635 nm). Allow the Colorimeter to warm up for about five minutes before calibrating. Slide the lid of the Colorimeter open to reveal the cuvette slot. Insert a cuvette, filled with distilled water or other solvent used to prepare your solutions, for your calibration blank (100% transmittance or 0 absorbance). Important: Line up one of the clear sides of the cuvette with the arrow at the right side of the cuvette slot. Slide the Colorimeter lid closed. Press the CAL button on the Colorimeter to begin the calibration process. Release the CAL button when the red LED begins to flash. When the red LED stops flashing, the calibration is complete. The absorbance reading should be very close to 0.000 (100%T). Remove the blank cuvette from the Colorimeter. Elaine Nam, Ph.D., introduces the experiment, Determining the Concentration of a Solution: Beer's Law, from Chemistry with Vernier. 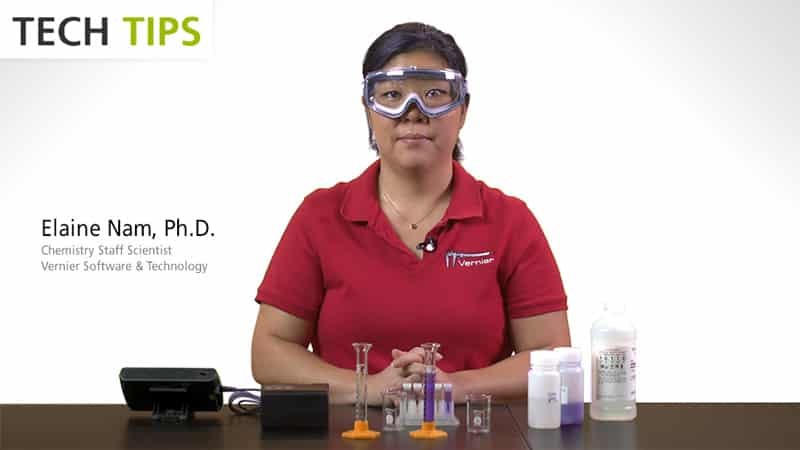 Use a Vernier Colorimeter to determine the concentration of an unknown solution. The 4-wavelength Colorimeter measures the amount of light transmitted through a sample at a user-selectable wavelength in order to determine the concentration of a solution. Features such as automatic sensor identification and one-step calibration make this sensor easy to use. Light from an LED light source passes through a cuvette containing a solution sample. Some of the incoming light is absorbed by the solution. As a result, light of a lower intensity strikes a photodiode. Allow the Colorimeter to warm up for about 5 minutes before calibrating. Fill a cuvette two-thirds to three-fourths full with liquid, including the calibration blank, so that the light travels through the liquid reliably. After filling a cuvette with liquid, seal the cuvette with a cap to prevent spills. Make sure to place a cuvette in the Colorimeter so the path of the light source travels through the clear sides of the cuvette. An arrow to the right of the cuvette slot shows the light path. For best results, use one cuvette to make all your measurements for a given experiment. If you calibrate a Colorimeter and then change the wavelength, calibrate the Colorimeter again to ensure the proper identification of the new wavelength. We have found that Beer’s law experiment results begin to lose their linearity at absorbance values above 1.0 (percent transmittance values less than 10%). If you have a solution that transmits such a low level of light, consider diluting the solution so that it falls within this range. 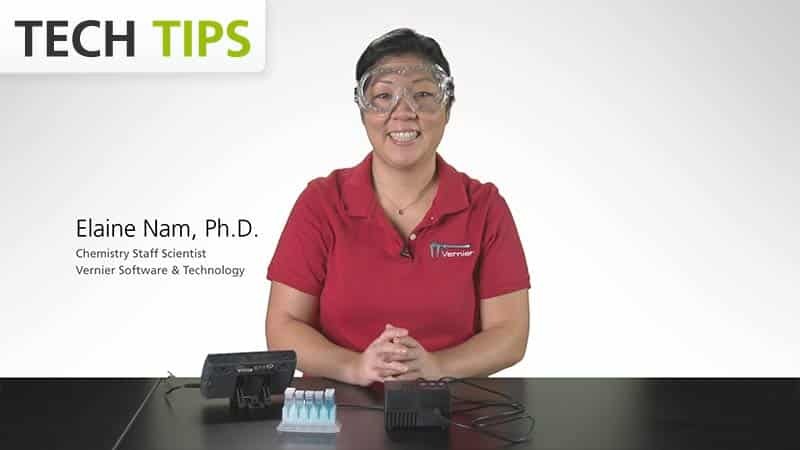 If you have watched the related product video(s), followed the troubleshooting steps, and are still having trouble with your Colorimeter, contact Vernier Technical Support at support@vernier.com or call 888-837-6437. Support specialists will work with you to determine if the unit needs to be sent in for repair. At that time, a Return Merchandise Authorization (RMA) number will be issued and instructions will be communicated on how to return the unit for repair. This warranty does not cover consumables, such as the cuvettes and lids.